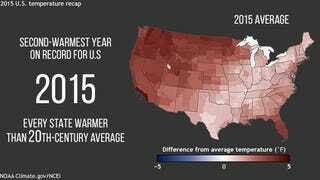 The National Oceanic and Atmospheric Administration announced yesterday that 2015 was the second hottest year ever recorded in the United States, with a major last-minute boost from our freakishly warm Christmas holiday season. It was also a record-breaking year for fire, as the US Department of Agriculture announced Wednesday. For the first time in history, wildfires scorched over 10 million acres across the country. The Pacific Northwest and Alaska were hit hard, with over 20 massive fires burning through 100,000 acres of land. Both NOAA and NASA are expected to announce that 2015 was the hottest year on record globally. That’ll be no surprise to anyone who has read our coverage of hottest month after month after month after month. El Niño is partially responsible for 2015's global heat wave—the US also saw record precipitation in December, another expected El Niño outcome—but with 14 of the 15 hottest years on record occurring in the 21st century, the logical argument is that Earth is sitting on a trend line. Hot, fiery years like 2015 are the future. That’s a fact that many Americans still haven’t accepted, according to a study published in Global Environmental Change this week, which shows that climate science denial is alive and flourishing in the United States. “We find little support for the claim that ‘the era of science denial is over,’” the study concludes. Indeed, a 2014 Gallup survey showed that one in four Americans still don’t believe human activity is causing Earth’s climate to heat up. How could public views be so at odds with the overwhelming consensus of science? Simple: the anti-climate propaganda machine is working harder than ever. The new science denial study, which looks at over 16,000 documents published online between 1998 and 2013, found that conservative anti-climate groups like the Heartland Institute have exponentially ramped up their climate change misinformation campaign in recent years. The study also reveals a broad shift in the climate communication strategy of conservative thinktanks since the early 2000s. Rather than attacking climate policy, these groups are now far more concerned with undermining basic science. It’s probably no surprise to hear that many of the 19 thinktanks profiled in the study receive funding from fossil fuel interests, including oil giant Exxon, which is currently in the midst of an embarrassing public investigation following revelations that the company covered up its own climate change research in the 1970s. In spite of the well-funded effort to rewrite history and science in the United States, leaders from 190 countries did manage to come together in Paris this past December and strike a historic agreement to end the use of fossil fuels this century. As we embark on what’s widely expected to be another record-smashingly hot year, let’s hope that the momentum we gained in Paris doesn’t get trampled by the denial machine that would see the world burn before giving up oil.